Underground contractors and municipalities around the world are using HammerHead® static pipe bursting equipment as an effective method to replace existing water, gas and sewer lines. Pipe bursting follows the path of the existing utilities, reducing utility strike risks and eliminating up to 85 percent of excavation work compared to open-cut methods. HammerHead leads the industry with proven technology and features designed to increase productivity. 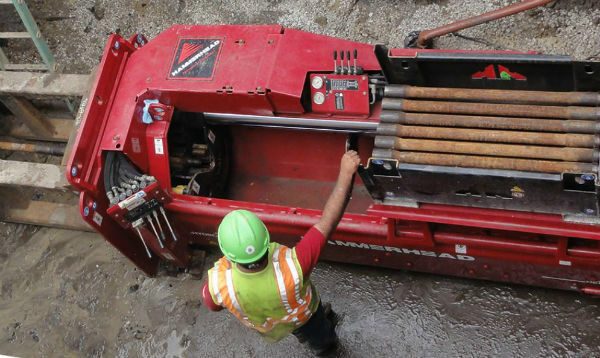 HammerHead Trenchless is known for our state-of-the-art pipe bursting systems. And it’s true that we lead the industry in innovative design. But we also include basic systems in our pipe bursting line up so that we can provide a solution to match whatever your operation requires. When you want the power of a compact, straightforward pipe bursting system for 2- to 8-inch pipe, we offer the HydroBurst® HB5058. The HB5058 gives you up to 50 tons of simple, brute-force pulling power. Its lightweight API-style threaded rods can be pulled on from any location to keep your burst efficient. You’ll never need to stop midway through a burst to wrestle pull rod the way you would using expensive “bicycle chain” designs that disengage if misaligned. For trenchless gas, sewer or water main replacement jobs, count on hassle-free operation from the HB5058. Powerful and agile, the HydroBurst 100XT is a highly versatile unit that is a practical solution for a wide range of sewer, water and gas line replacement jobs. Designed with the user in mind, the 100XT has the strength to replace pipes up to 16" (400 mm) yet is compact enough to efficiently replace pipes as small as 4" (100 mm). With just one static bursting unit, you will have the ability to perform a wide range of jobs maximizing their return on investment. The HydroBurst 100XT is designed to enhance efficiency and productivity while maintaining a high level of dependability and performance to help ensure no time is wasted on the job.